It’s Election Day here in the US! I am feeling proud and thankful to be able to vote for someone I believe in. I am thankful for the women in history who fought for my right to vote as a woman. I am thankful for those who fought in our history’s wars so we could continue to enjoy the right to vote today (especially the World War II veterans, who always have a special place in my heart). I am thankful for the men and women who are still protecting our freedoms and the freedoms of others. I am also feeling anxious, nervous and scared to see the election results unfold tonight during our Election Party. Naoto has already told me that I shouldn’t cry in front of the guests. I couldn’t make him any promises. What a wonderful blog! After listening to T.V. this A.M. it really does make you nervous about the outcome. We will try to keep good vibes until the end. Hope you don’t have to cry in front of guest. I concur!!! I was just telling my husband how I am happy woman fought for the right to vote. It is a great feeling to know we have such wonderful freedoms. I will be here nervous with you. I’ve been thinking about the history of women voting all week long. 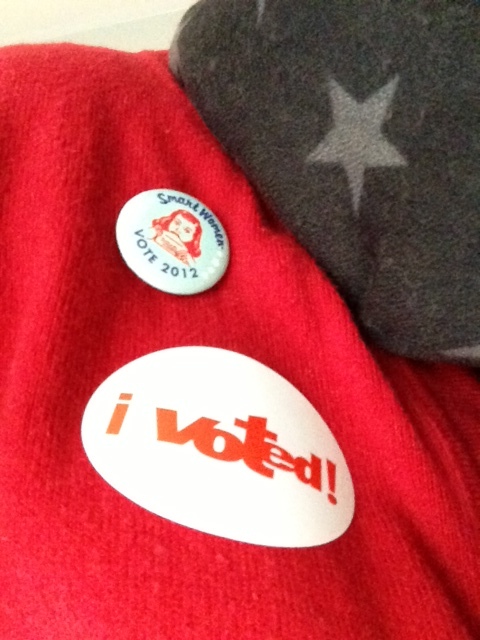 I’m ever so grateful for the opportunity to vote. Why yes it IS a Target scarf! I almost bought the yellow one too, because one cannot have too many star scarves!